Please note that this is the spanish version of the interview. Luisito Quintero was born in Caracas, Venezuela, where he was surrounded by Afro-Venezuelan and Afro-Cuban rhythm and music. His father, a respected percussionist in his native country, tutored and encouraged Luisito on timbales through his adolescent years. Luisito comes from a long line of outstanding musicians which includes his Uncle, Carlos Nene Quintero and cousin Robert Quintero. Luisito studied at the respected Orquesta Simfonica de Venezuela (The Symphonic Orchestra of Venezuela), and his percussion technique soon garnered attention from his colleagues. He joined the popular music ensembles Grupo Guaco and Oscar D’Leon, where he enjoyed widespread worldwide exposure. Besides being known for his skillful timbale work, Luisito also plays congas, bongos, drum set, djembe, dundun and a wide variety of assorted percussion instruments. His technique on all of these instruments is masterful and unparalleled. 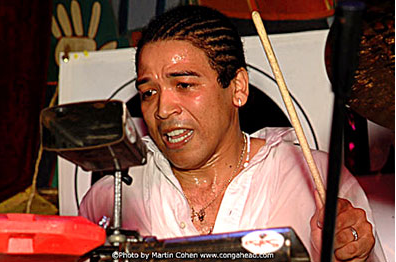 Luisito has worked with , Jack De Johnette, David Sanborn, George Benson ,Joe Sampler, Bill Cosby, the late Celia Cruz and Tito Puente, Eddie Palmieri, Marc Anthony, Gloria Estefan, Richard Bona, Ravi Coltrane, Claudia Acuna, Giovanni Hidalgo, Toshiko Akiyoshi, Willie Colon and countless other high-profile music acts. Quintero is comfortable working in any genre of music from Symphonic to Jazz and from Latin to House. One of his most recent projects finds him as musical director for Louie Vega and the Elements of Life Band as well as extensive work with Jack DeJohnette’s Latin Project. He is also co-musical director and percussionist for Kevin Jones and Tenth World. He is one of the most sought after percussionist in the country at this time and will continue to build his legend as time goes on. Luisito is also a skilled clinician who shares his limitless knowledge of music to younger percussionists around the world. Today, he is an established and respected musician, teacher, band director, and master. Click here to listen to the podcast interview of Luisito Quintero.